Dasuquin is a comprehensive joint health supplement that provides the same key benefits as Cosequin with the enhanced effects of ASU. 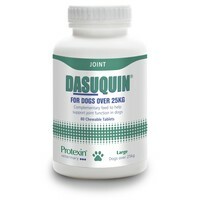 Dasuquin combines Cosequin’s proven FCHG49 glucosamine hydrochloride and TRH122 low molecular weight chondroitin sulfate with NMX1000 ASU (avocado/soybean unsaponifiables). The ingredients work together to support cartilage production and help block enzymes in the joints that break down new and existing cartilage. Allow 4-6 weeks initially to note a response, though some dogs may respond sooner. If desired the number of tablets may be reduced to a maintenance level.